I’ve heard from my mentor at last! We haven’t talked about revisions yet, but we have scheduled our first discussion for Monday and are planning to step right into editing. After seeing his email, I’m feeling pretty good about what is to come and am currently looking forward to the sections we’ll work on first. Until then, however, I’ve found something else to occupy my time with. Contrary to the title, it’s not Jacob Wonderbar, but his creator (and possibly my new obsession), Nathan Bransford. Thanks to T. Margaret Haviland, I came upon Mr. Bransford’s blog just this week and have become completely enthralled with it. 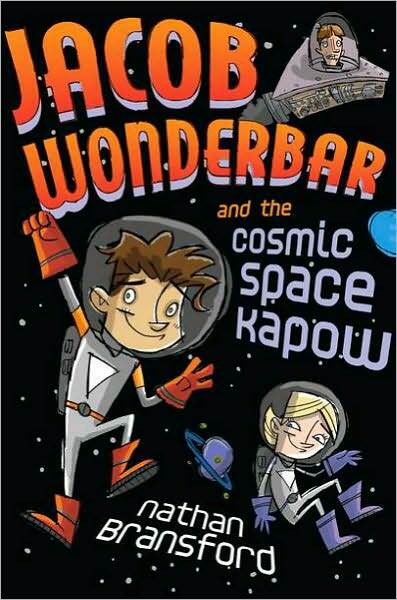 Nathan Bransford, the author of Jacob Wonderbar and the Cosmic Space Kapow, Jacob Wonderbar for President of the Universe, and Jacob Wonderbar and the Interstellar Time Warp, used to be a literary agent at Curtis Brown Ltd. and the social media manager of CNET. He is now the Director of Community and Social Media at Freelancers Union. Although Nathan’s blog is more targeted towards those who are interested in writing a novel, his blog is really a goldmine for anyone who’s interested in writing. It touches on a variety of topics, from how to handle being critiqued to fun posts such as The Rory Gilmore Reading Challenge, and gives plenty of advice on the writing lifestyle, including how to find a literary agent, what the publishing process entails, how to write a synopsis, the basics on how to edit as well as write a novel, and so much more. There are also plenty of useful links to other author resources, agent and editor blogs, writer’s blogs, book blogs, publisher blogs, and literary journals, which are all next on my list of websites to look into. If my excitement from before didn’t give away my intentions, my plan for the rest of the semester (and probably the rest of my writing career) is to check out his site every few days and to draw inspiration from Mr. Bransford’s blog. If I find something that’s particularly helpful or amazing, which I undoubtedly will, I’ll share it with you all and tell you how it has changed my writing experience and outlook. I already know of a few blog posts that I can’t wait to talk about! Lastly, if you’re curious and Nathan Bransford has piqued your interest, you can find his blog at http://blog.nathanbransford.com/. It’s well worth the four hours I’ve already spent on the website! This entry was posted in Literature and Poetry and tagged #learning, #students, edchat, innovation, literature, writers on September 15, 2013 by Taylor Griffith. What an exciting artistic journey you’re on! I had no idea you were a novelist. Thanks for the link to Nathan Bransford’s website. I enjoy reading other writers’ ideas about writing. I’ve been reading a book a friend recommended called Wired for Story: The Writer’s Guide to Using Brain Science to Hook Readers from the Very First Sentence, by Lisa Cron. It’s helped me a lot in the stories I create with my students. I look forward to following your blog as you start to get feedback from your mentor and your work enters a new phase.